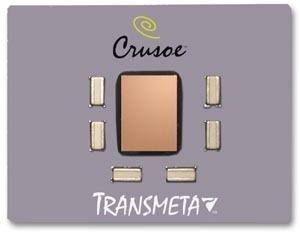 The Transmeta Crusoe TM5800 is a low power and slow mobile CPU for laptops. The CPU is a 128-Bit VILV (Very Large Instruction Word) Processor which is much more simply than a x86 CPU. Due to Code Morphing, the TM-5800 was able to emulate x86+MMX in Hardware.